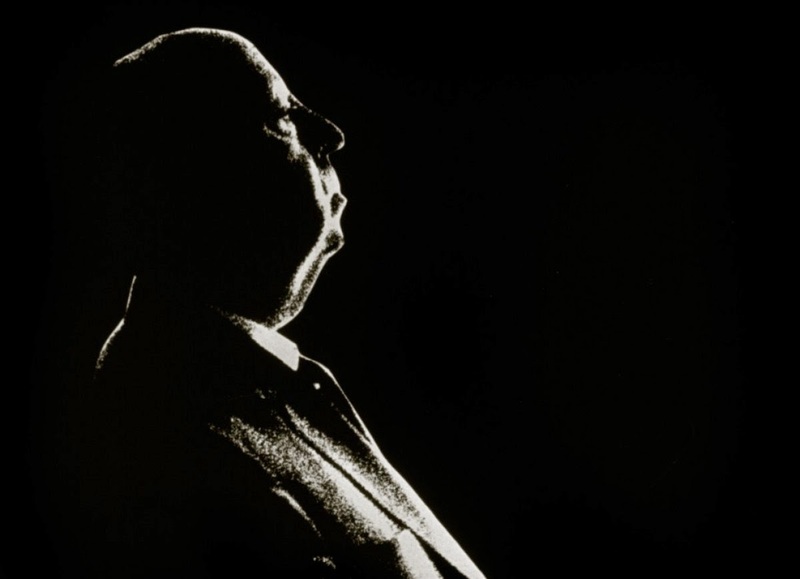 I am constantly in awe of the talent and style of Alfred Hitchcock - arguably one of cinema's great visionary film makers whose output was unique as much for its countless iconic moments of memorable cinematic mastery as it is for the generally 'top shelf' analytical recognition and critique encompassing by far the more substantial chunk of Hitch's film output which easily out weigh in number the lesser efforts and critical failures. Sure, not all of Hitchcock's pictures were commercial successes, with several only receiving their 'lost' audience some decades later. Far more than just a director, Hitchcock was a highly intelligent, well read man whose numerous interviews both on the printed page and on film are rarely anything less than a sourse of inspiration, technical insight and revelation into the entire process from initial idea to finished release- all aspects of which Hitch knew inside and out. 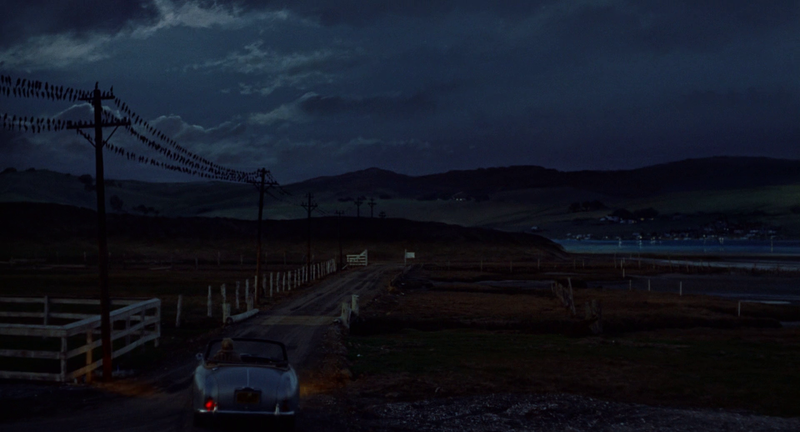 I never fail to be thrilled by the master and his filmic structure. Among the many, many superb scenes (without a single visual trick) are: Cary Grant carrying 'that' glass of milk up the stairs to Joan Fontaine in the excellent and under rated SUSPICION (a blog with all the many mattes in high def BluRay from this film will come here soon); The sinister long shot of the tennis crowd in STRANGERS ON A TRAIN where every head is following the ball left to right to left except that one solitary individual sitting dead centre, with eyes only on our protagonist... really creepy and just so damned well handled. The unexpected sudden violent death of the boy on the bus in SABOTAGE - which no American movie maker would ever dare to suggest let alone show on screen; That long and ultimately revealing push in on the drummer in the band in YOUNG AND INNOCENT still sticks in my mind after seeing it 30 odd years ago; Martin Balsam's slow and unsure ascent of that staircase in PSYCHO - certainly one of the most white knuckle cinematic moments in history; The sea of umbrellas and uncertainty for Joel McCrea in the wonderful FOREIGN CORRESPONDENT; The treachery of the unwanted passenger in LIFEBOAT that we so want to yell 'wake up' at the screen; That lone bird landing upon the playground equipment unnoticed by Tippi Hedren in THE BIRDS followed by an almost unbearable few minutes showing just Tippi and not whatever is happening behind her - pure genius; Kindly Uncle Charley's real persona unveiled in SHADOW OF A DOUBT; Henry Fonda's ultimate encounter with his doppleganger in THE WRONG MAN and one of my favourites, Police Inspector Alec McCowen's earnest attempts to find nourishment from one of his wife, Vivien Merchant's misjudged culinary experiments in the very dark comedy thriller FRENZY all the while discussing gruesome murder methodology. 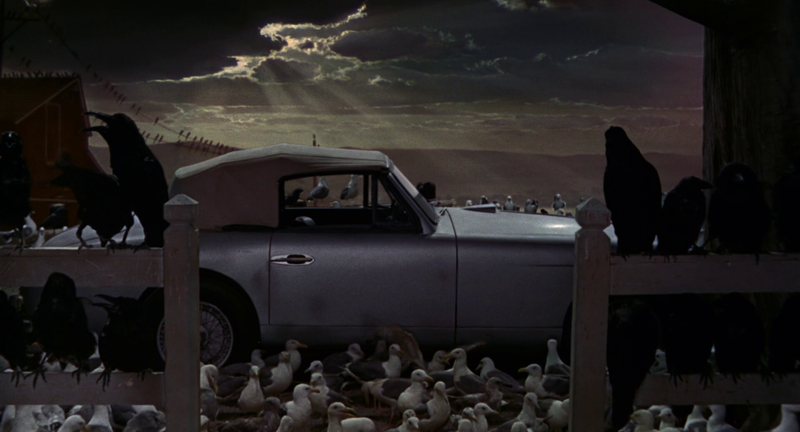 Today's blog covers four of Hitchcock's later films - each from the master's 1960's catalogue: THE BIRDS, MARNIE, TORN CURTAIN and TOPAZ. 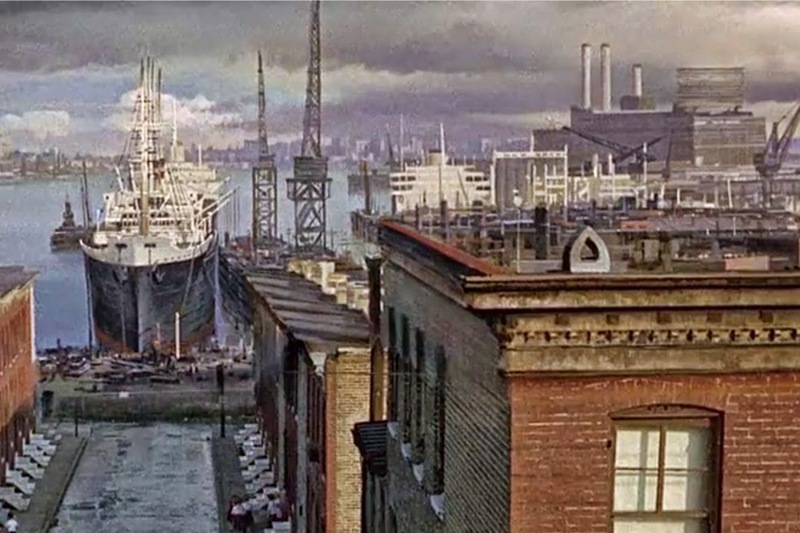 All have elaborate and supremely well executed matte painted shots by Albert Whitlock and feature some of Al's best ever trick work, with a few shots here never seen before nor noticed by the audience. 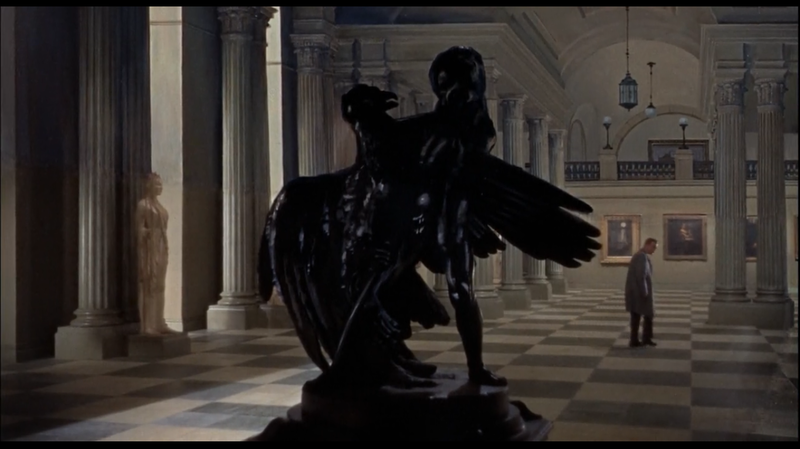 Not only is Whitlock's matte work breathtaking here but so is Hitchcock's concept and approach as to just how such a trick should be used. Hitchcock loved using special photographic effects and practically all of his films include trick shots ranging from basic process work to miniatures, glass shots, moving split screen effects, travelling mattes, perspective tricks and often totally fresh trickery devised expressly for a given production, such as Martin Balsam's demise in PSYCHO which really was something else and baffled me for years. 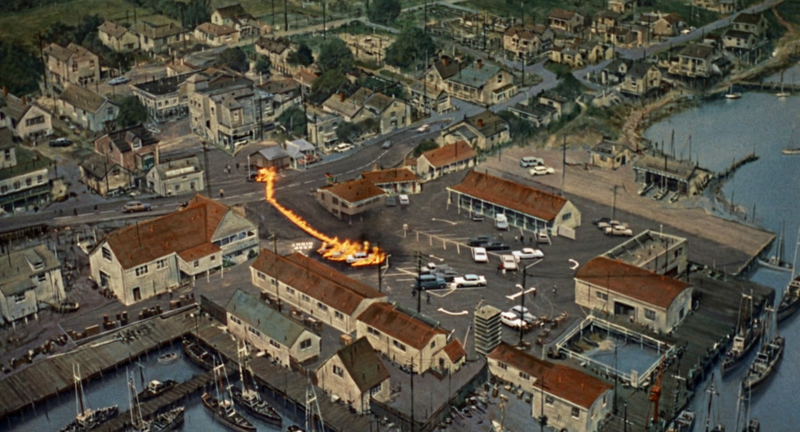 I've excluded PSYCHO from today's article even though it does have a few relatively minor invisible optical combination shots. 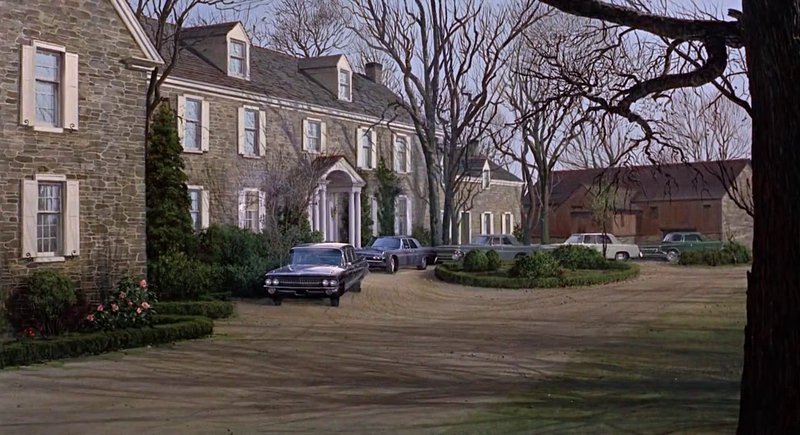 There is a barely detectable matted in sky during Marion's drive to the car sales lot, a shot of the house on the Universal lot with a matted in under cranked cloudy night sky element added by Saul Bass, and a classic Hitchcock multi-element moving split screen right after Marion's murder which combines the shower room set, the motel room set and a process screen shot of the house all in the one dolly shot (though it's three separate shots optically combined to great effect - a gag Hitch used often and featured as the first trick shot in THE BIRDS as well). 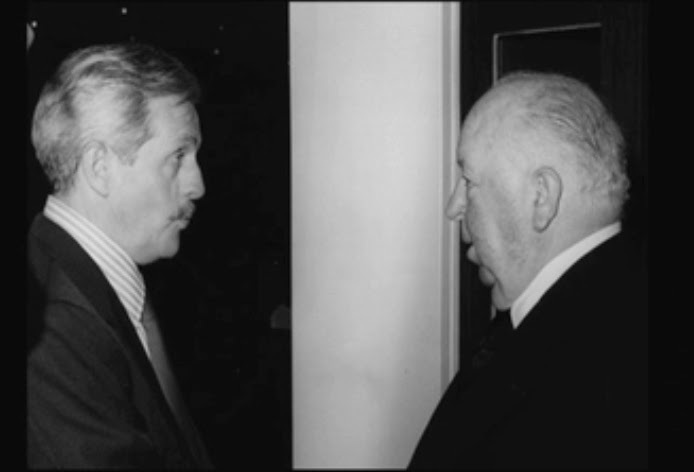 Two masters of their respective crafts, circa 1976. 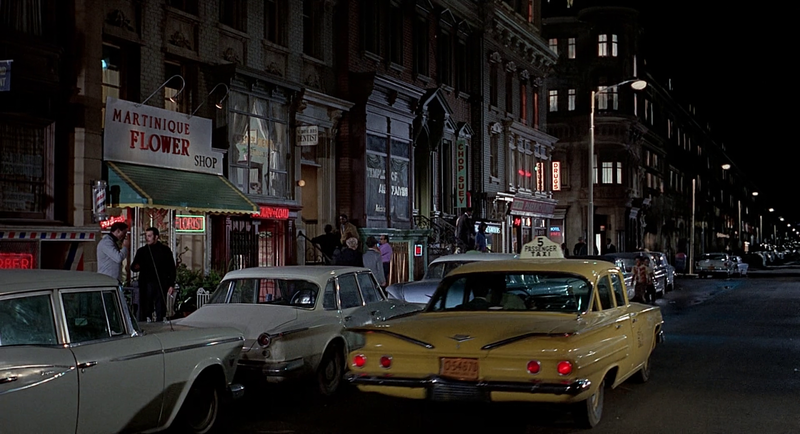 The four films featured here today show Albert Whitlock's matte art to great effect as I managed to get good BluRay high definition screencaps that show more detail than previously seen - and show a few shots I'd never spotted till now. I confirmed these additional shots with Al's cameraman Bill Taylor, who although he wasn't working with Whitlock at that early period in his career, was friends with Albert and would frequently visit Albert at Universal and see works in progress. There is however one shot in this selection that Bill feels most likely isn't a matte, though I feel it looks very suspect (in the good sense of the word) so I've included it in the blog for my readers to ponder over. You'll come across it further down. Hitchcock and Whitlock shared a creative collaboration that began way back in their early days in the 1930's in the UK studios of Gaumont Lime Grove, where a young and impressionable Whitlock had graduated from handing out carpenter's nails and tools for the studio set builders, to showing some considerable flair as a sign writer, title artist and later a backing artist before moving into miniature work and ultimately matte painting - for which he became most proficient and very highly regarded throughout the industry. An 18th Century Whitlock 'original' for Hitch. Whitlock was signwriter and "general factotum" on Hitchcock's THE LADY VANISHES  and was involved in others as well during Hitchcock's British era in the thirties. The pair would not cross paths again until a few decades later when Hitch was prepping THE BIRDS in 1962, where according to Whitlock the penny only dropped for Hitch once Al had regaled stories of those Gaumont days that only the pair of them would have been privy to. Hitch and Al would continue from then on to share a sound friendship as two ex patriot Londoners with similar tastes and similar backgrounds and appreciation for all things English such as the civilised 'tea break' [(here, here!!]. 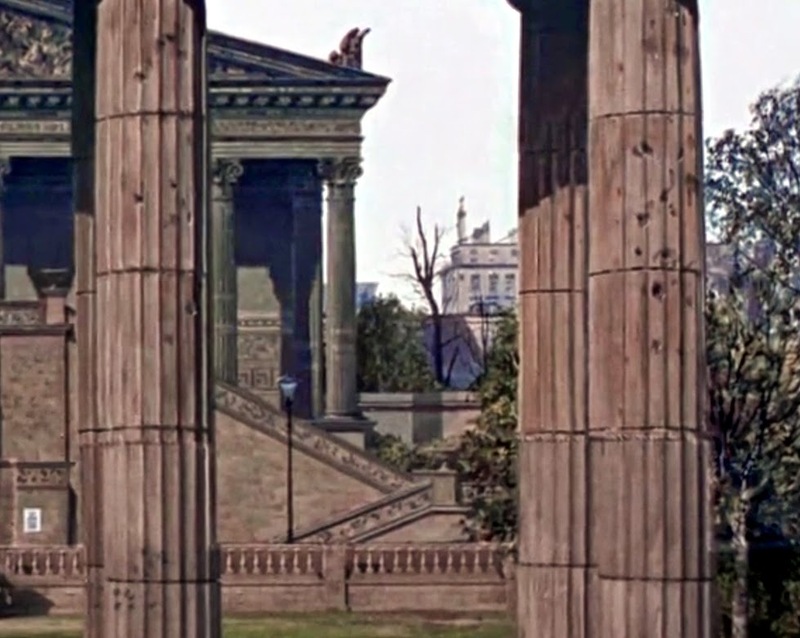 Albert, in addition to painting mattes on all seven of Hitch's last films and providing key creative input, would find additional commissions in skilfully replicating some of Hitch's own classical art collection so that the pieces could be jointly appreciated at both of Hitchcock's geographically separated homes. 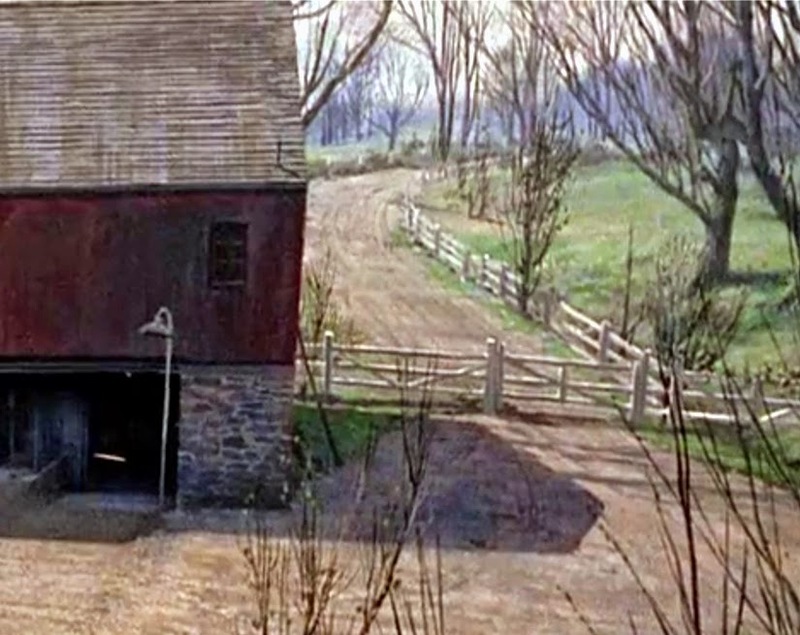 Such was Hitchcock's influence he would even devise a proposed matte shot where one wasn't really required for FAMILY PLOT so as just to have his old friend on the film. 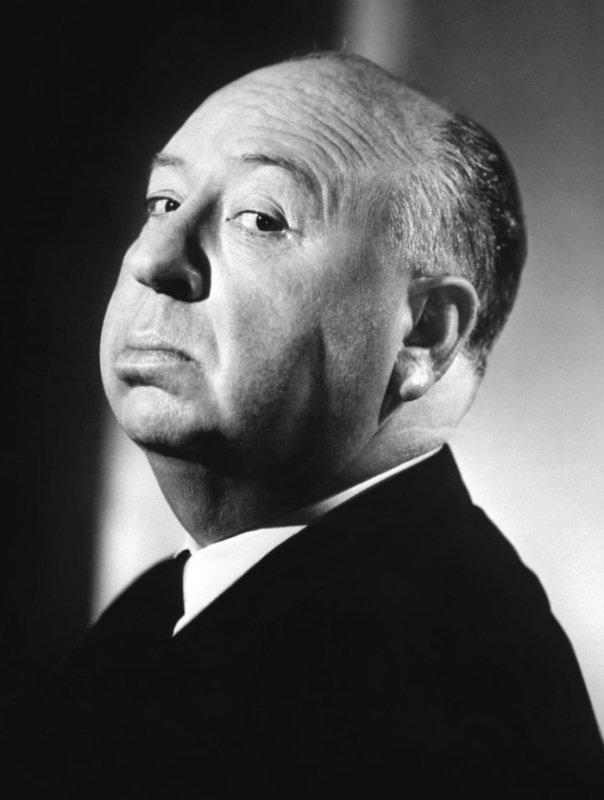 Hitchcock once publicly stated that Albert was "the finest technician that we have in our business today". Al & Mel share a moment of HIGH ANXIETY. 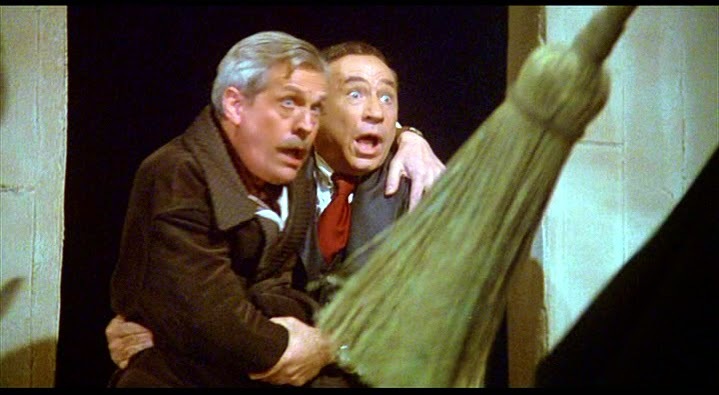 Interestingly as a side note, Mel Brooks' HIGH ANXIETY made in 1977 was a hit and miss tribute to Hitchcock's films and not only employed Whitlock as matte painter to capture the flavour of many of Hitch's classic trick shot moments, but also employed Albert as an actor in a pivotal role of the classic heroines father as seen in so many of the master's films. Apparently Hitchcock appreciated the tribute and found it amusing according to Brooks. 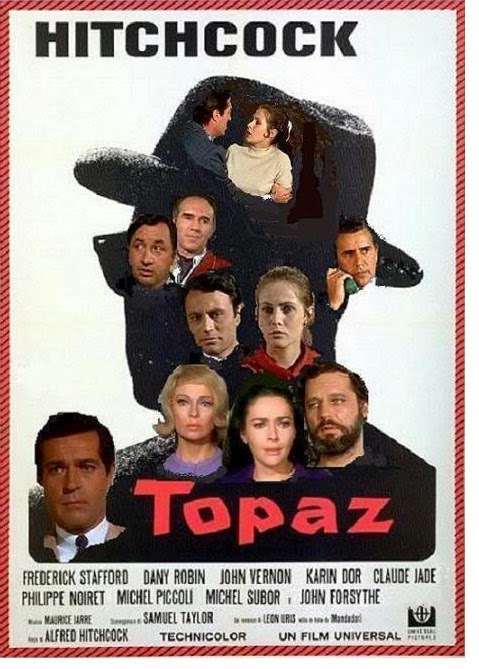 Still a great picture that, despite Hedren's primping and posing and Hitch's VERY annoying habit of shooting each of her close ups with gauzes and SunSilk Shampoo lighting that never matched any of the other edits.. 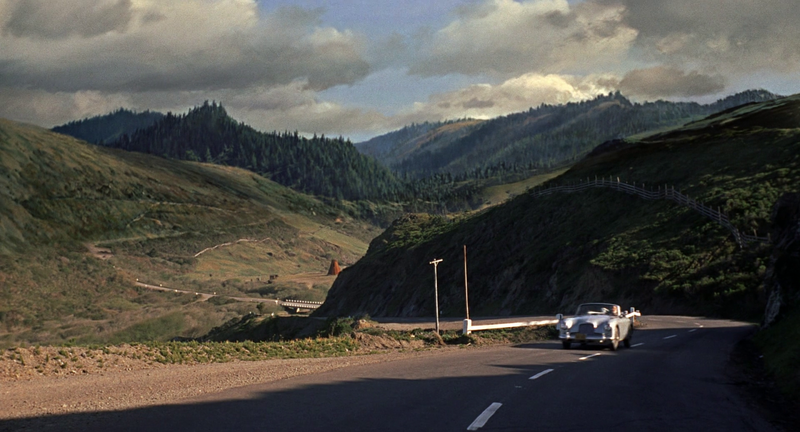 The sheer multitude of complex sodium travelling matte shots and multi-layered optical work by Ub Iwerks, Roswell Hoffman, Bill Abbott, Robert Hoag and Linwood Dunn still looks great and the mind boggles at how much went through those optical printers at the several effects contractors engaged to churn out the visual effects. 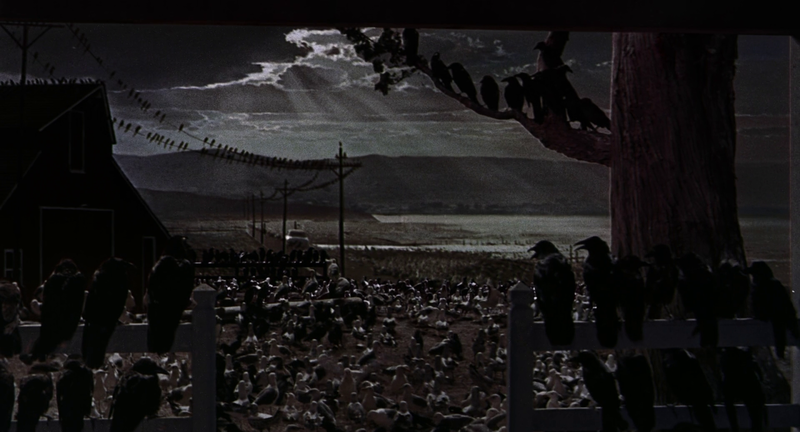 The first trick effect shot in THE BIRDS actually occurs in the opening scene. Although not a painted matte I'll include it anyway as a clever 'blink and you'll miss it' kind of Hitchcock sleight of hand. 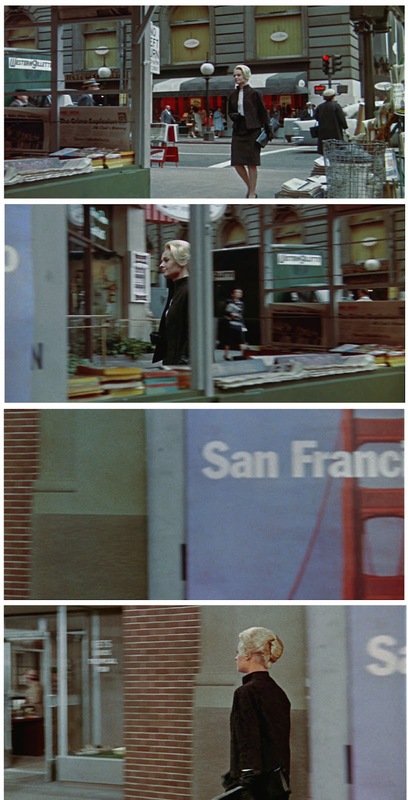 First two frames here show Tippi Hedren on an actual San Francisco street, and when she walks behind the billboard on the bus stop we, by way of a hidden moving split matte, are now on a set on the Universal backlot. Hitchcock loved these tricks and did them in several films such as FRENZY among others. 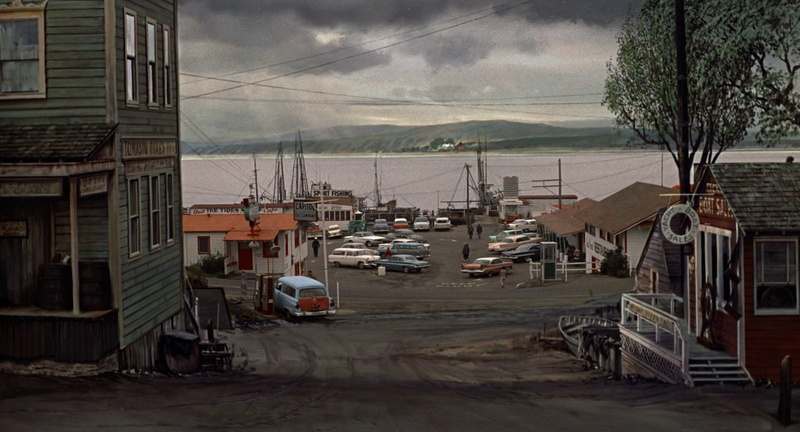 Hitch apparently hated locations and much preferred the controlled environment that a studio lot and stages could offer. Melanie en route to Bodega Bay. 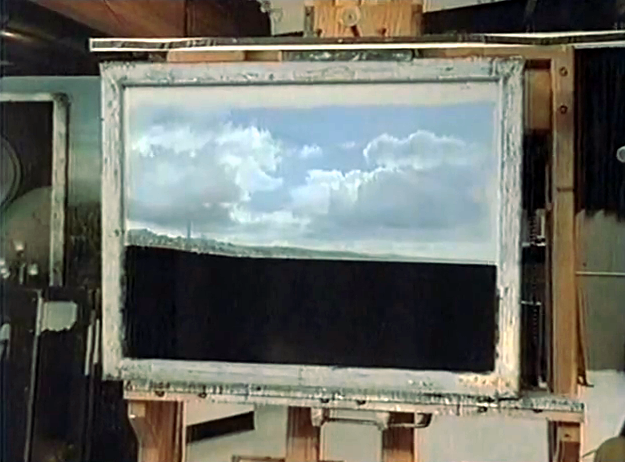 The upper half of the frame is all painted in by Albert Whitlock, complete with his typical multi band soft split moving cloud gag which he had mastered. 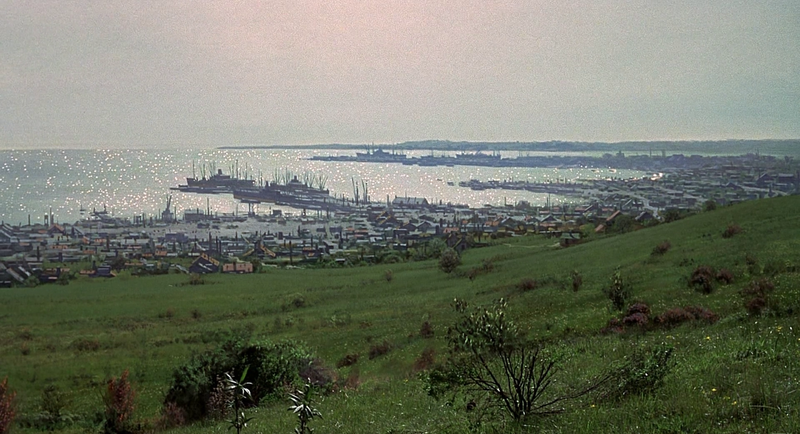 The scene was followed by a long shot of the Bay viewed from the hills which some say is a matte, though it never looked like one to me so I didn't include it. A great deal of mood has been created by Whitlock in various views of the town and Bay. 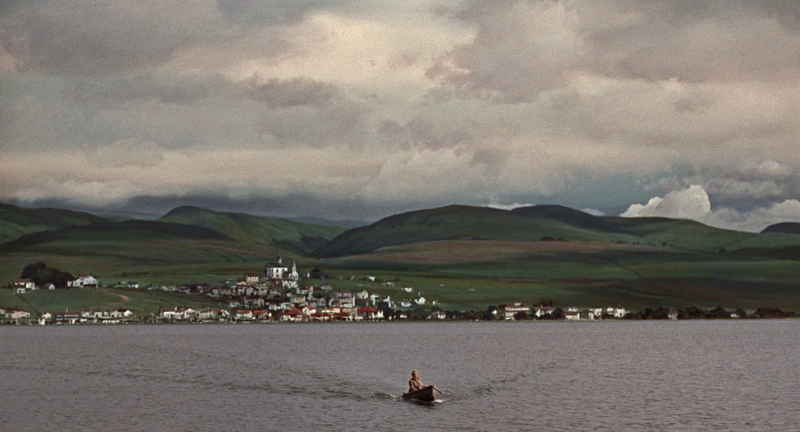 Hitchcock said: "Albert, I don't want scenics... put some of your clouds in here to lower the mood". I've made a close up capture from the above BluRay matte to good effect for detailed observation. Everything above the waterline is Whitlock art. 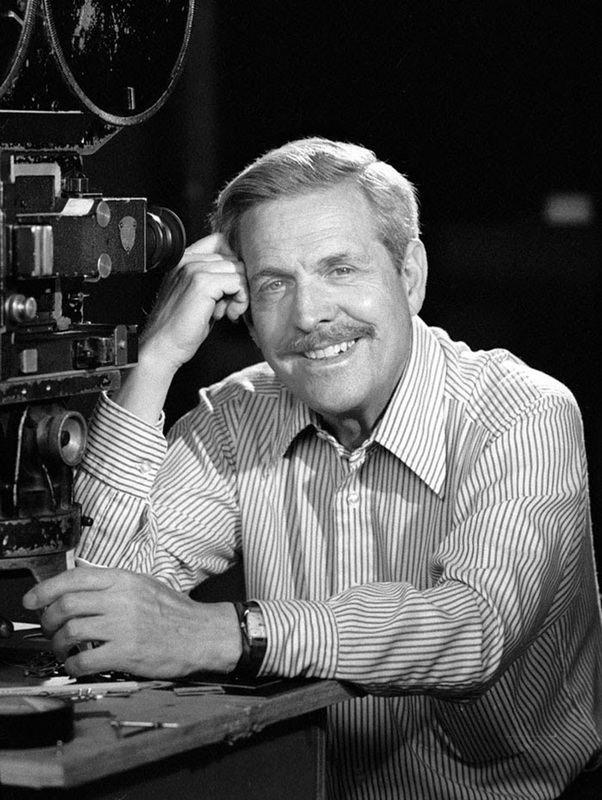 The cloud arrangement with a night sky 'hole' is a classic Whitlock attribute and one he's used in scores of matted night skies throughout his career, especially in his many, many Universal films. Love it! 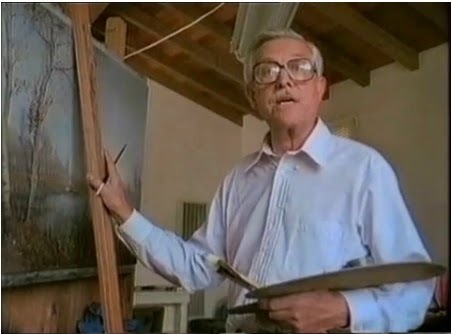 I'm sure Al acquired those sky techniques directly from looking over the shoulder of his one time mentor at Disney, Peter Ellenshaw, as Peter's skies too are such a thing of great beauty and display a similar free 'hand' in that they still dazzle me in his old shows such as the DAVY CROCKET's and JOHNNY TREMAIN's of old. 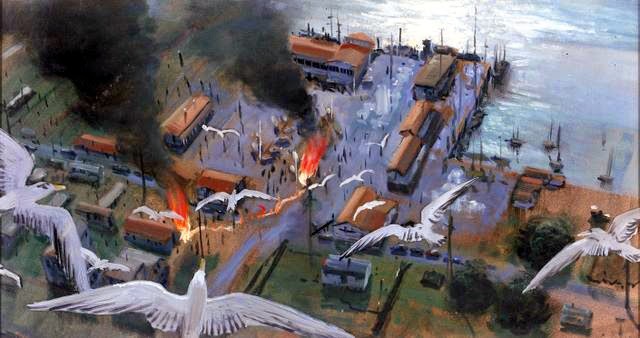 The bird's eye view of the carnage. 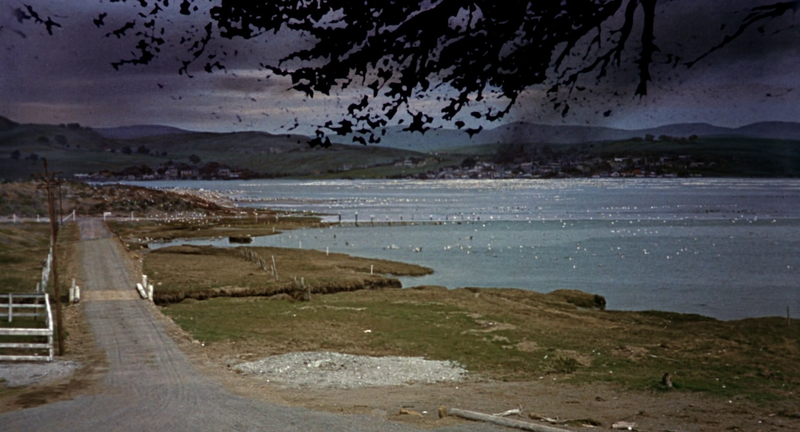 I purposely picked a frame without the gulls to show the full matte, though in saying that, the gull elements were brilliantly rotoscoped by Millie Winebrenner and composited by Ross Hoffman with no detectable flicker or 'shimmy' to jaw dropping effect that is sometimes seen in hand drawn opaque mattes. 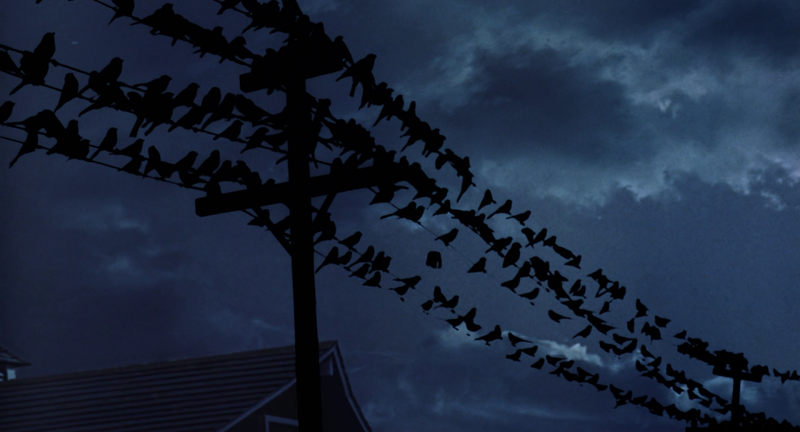 I was going to do a blog on ALL of The Birds fx shots (I have em all from the BluRay) but maybe another time. 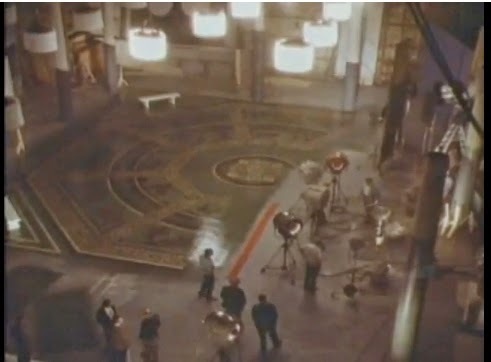 Live action element filmed by matte cinematographer Ross Hoffman on the Universal lot. An odd one here - the pecked out eye make up by Howard Smit didn't satisfy Hitchcock so he asked Albert to literally 'matte out' the guys eyes for the truly horrific quick shots which gave me nightmares back in the early 70's when I saw it on network TV. 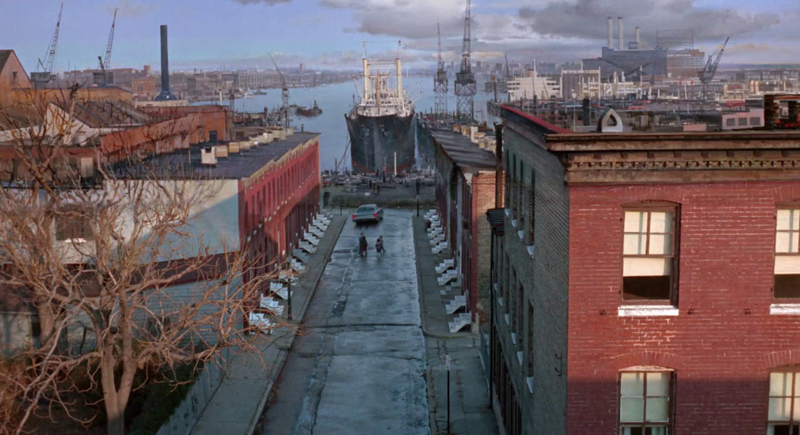 A full matte painted street, truck and all else which was used as a background element for the sodium travelling matte shot of Melanie in the phone booth. One of Albert's mattes that usually slips by un-noticed. Live action plate photography and preliminary comp for final shot. 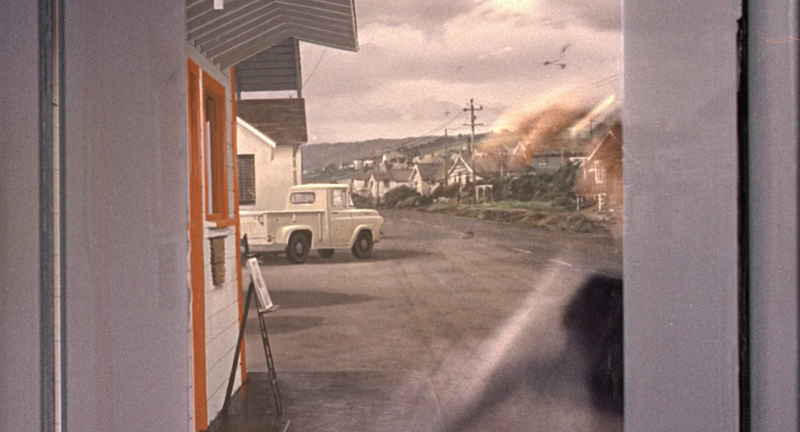 Final composite with some two dozen passes through the optical printer according to Hitchcock, and the most difficult shot in any of his films. 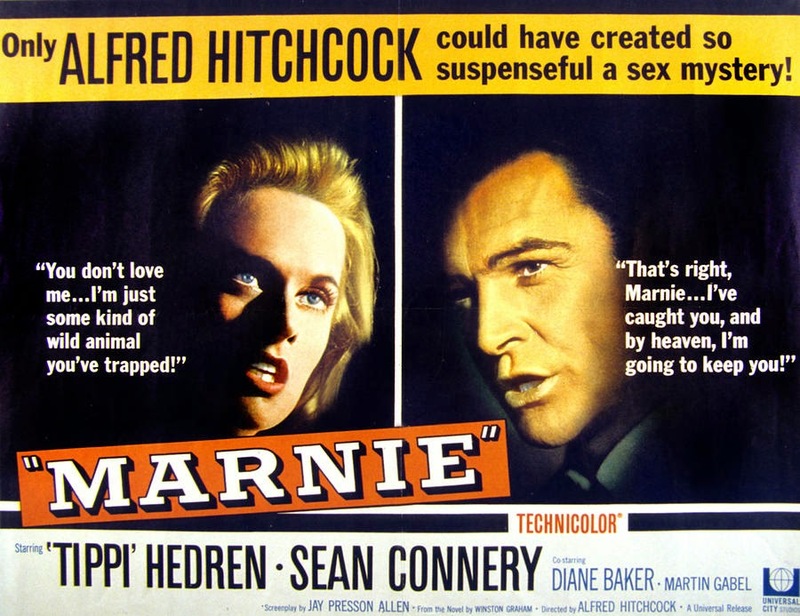 Not Hitchcock's best by any stretch, MARNIE is a heavy handed affair to say the least. 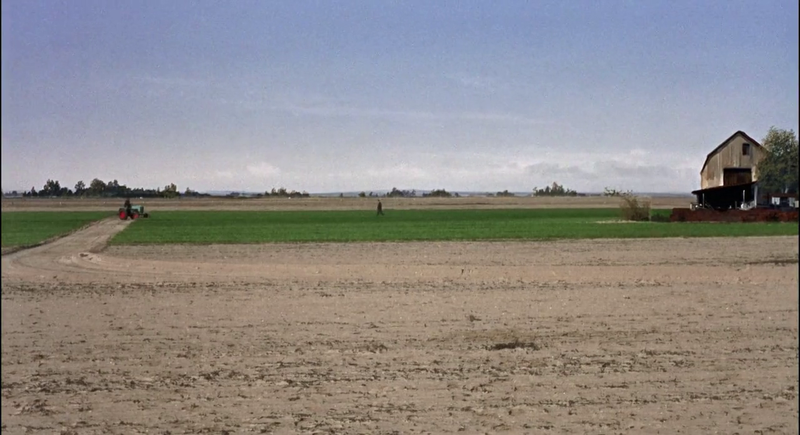 The opening matte from MARNIE is a beauty, though I'm told by Jim Danforth that Universal executives didn't like it and asked Al to remove the MARNIE mattes from his demo reel for reasons known only to themselves. 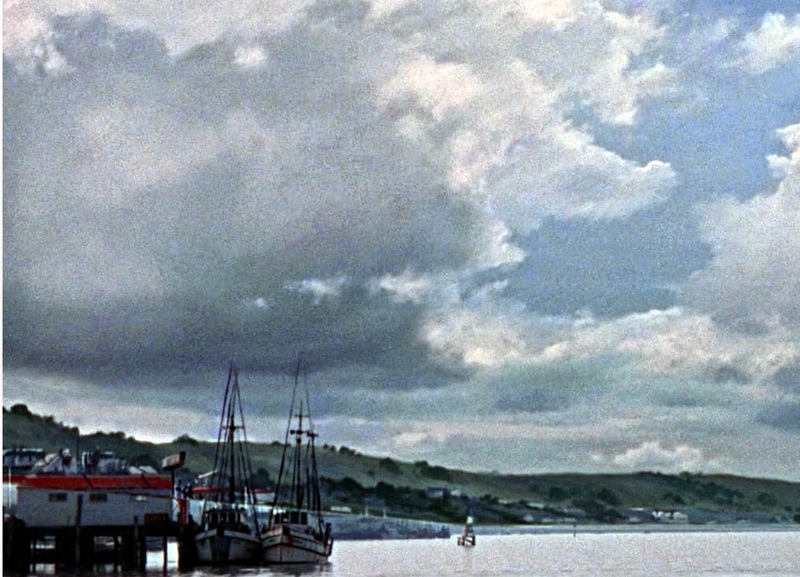 The shot re-occurs in the finale of the film though it's notably different (see below) with sky and other ships altered - presumably the same painting was used both times with Albert painting over aspects of it to make changes. Close detail from above, with matte line visible where Al has added the top to the building at right as well as the broad and busy harbour view. 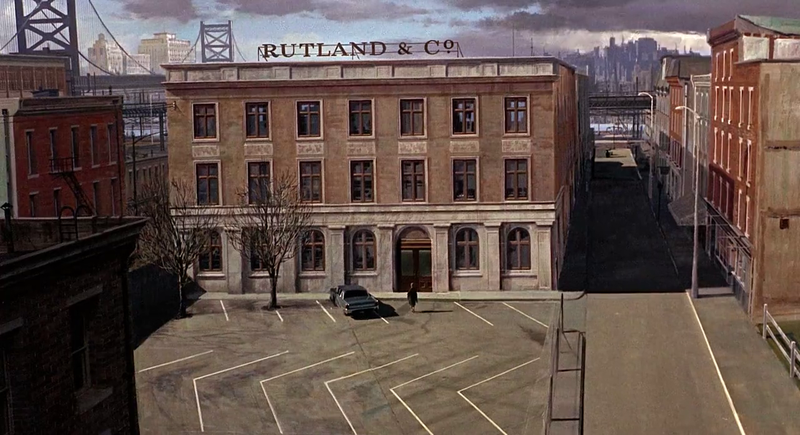 Nice matte here, almost all painted and with moving clouds, lightning and subtle interactive light flashes on background buildings. 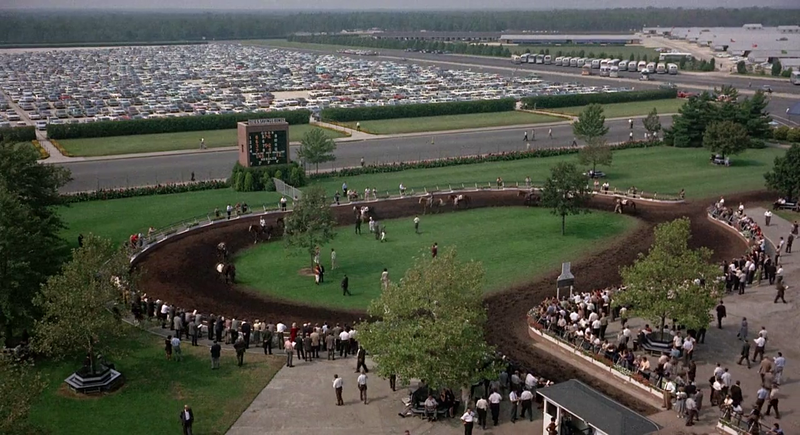 The racetrack matte where I presume the carpark has been filled up by Whitlock's brush. 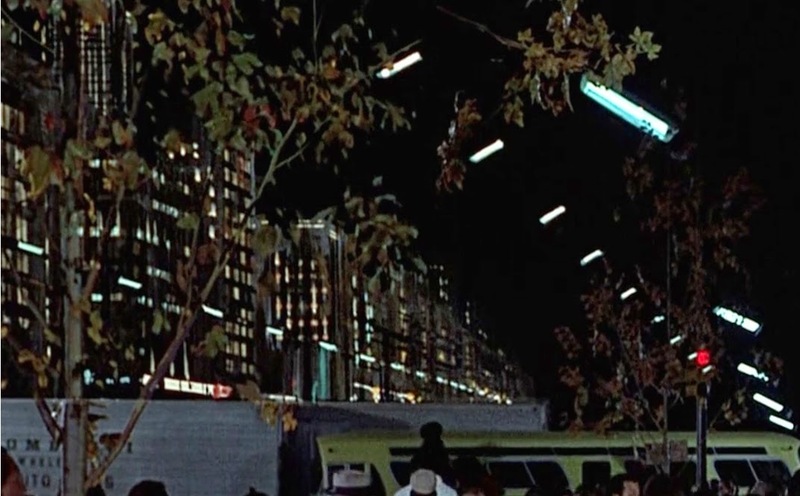 One of Al's most stunning mattes... all painted except small slice of earth where Connery and Hedren are walking. 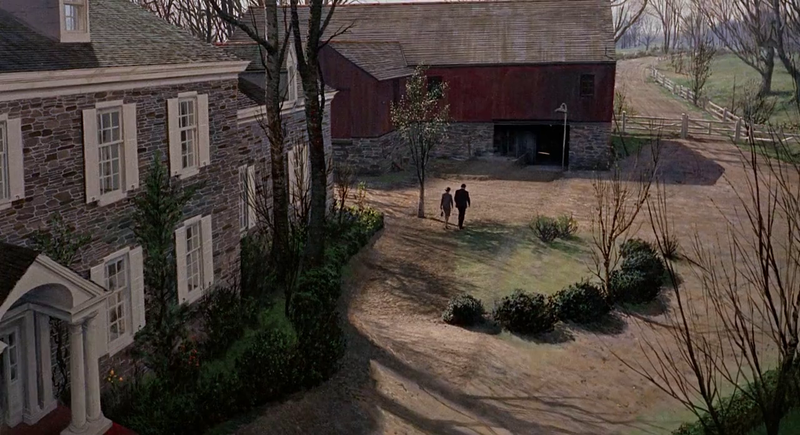 Some good clear detail from the BluRay frame showing perspective and hue. 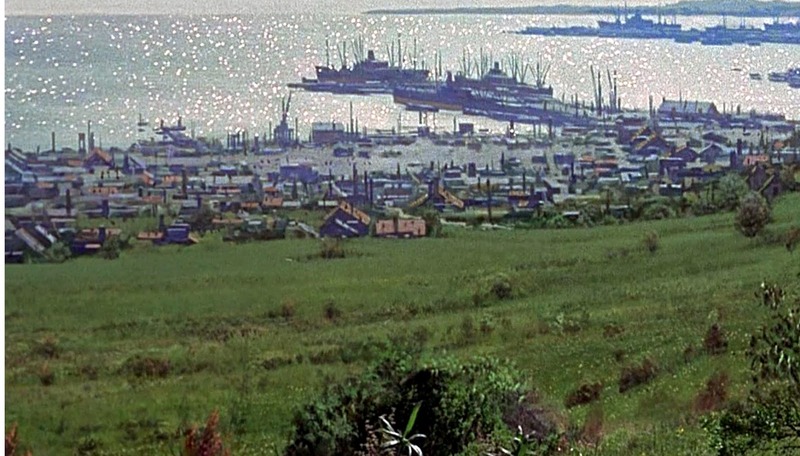 More detail from the same matte painting. 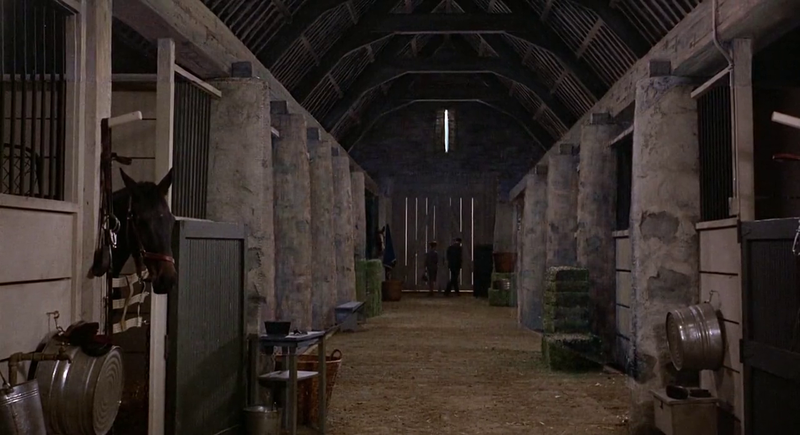 Inside the stables where Whitlock has painted in the roof and I strongly suspect, the columns and even the hay bales. 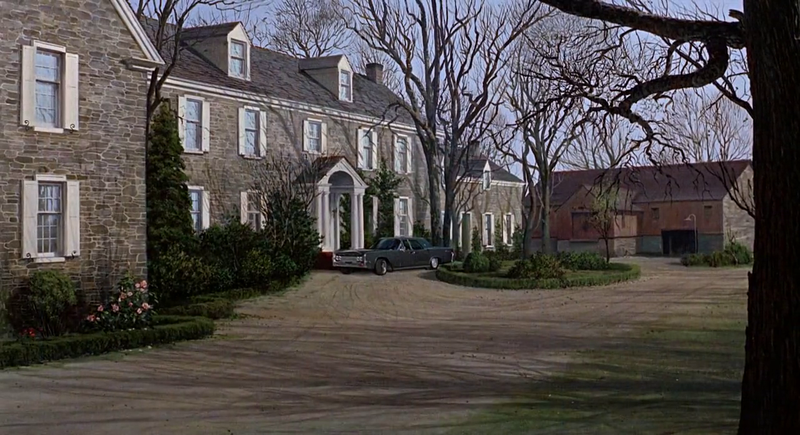 A full matte painting for the shot below, though a subsequent later shot with several cars is curious as a distinct matte line is visible and the foliage changes, suggesting either a different painting or a partial painting matted into this one?? 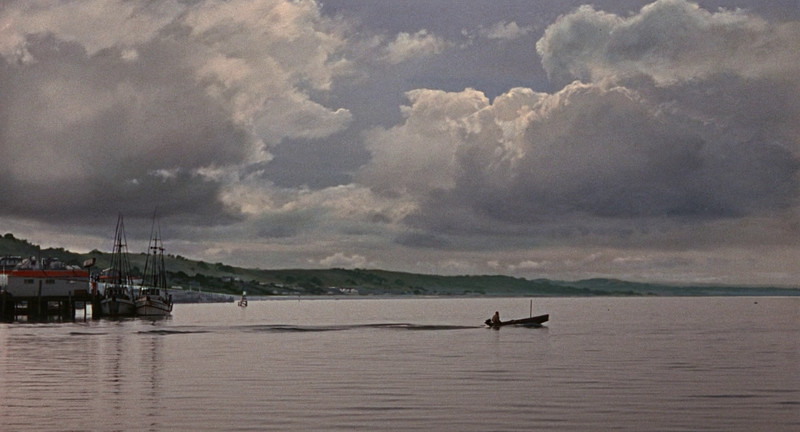 Gloriously sharp BluRay capture of the full Whitlock painted matte. 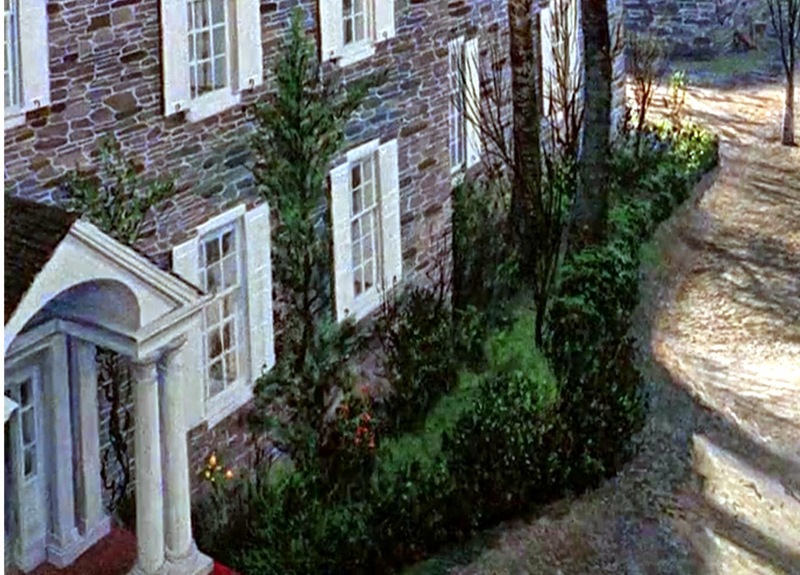 Same shot, seen later on with distinct change in various minor aspects of the garden, shadows and hues around the doorway. I should have asked Bill Taylor about this one. 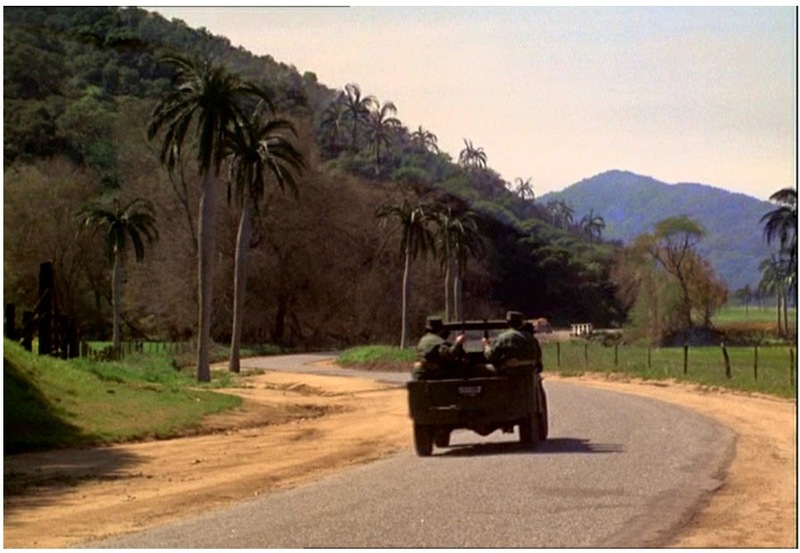 Closing shot with several changes in matte art from that which was seen in the opening shot. 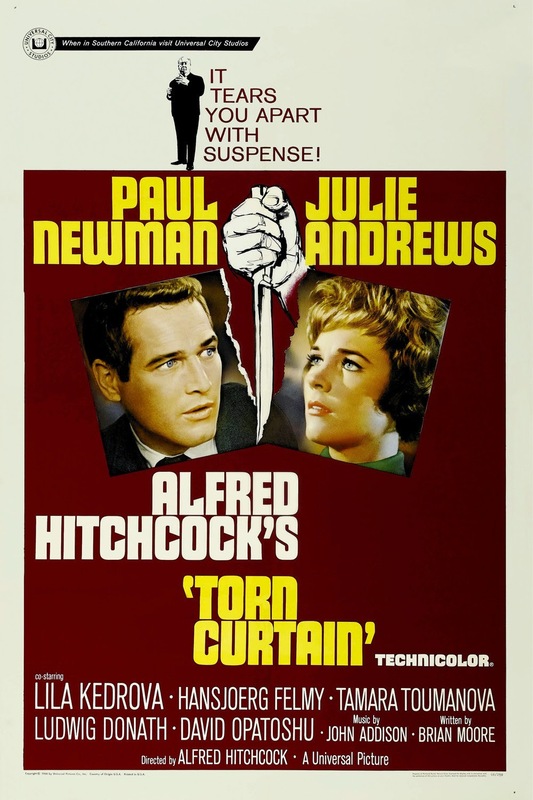 A much criticised entry in the Hitchcock catalogue, TORN CURTAIN probably suffered from it's lead casting as much as anything, with Julie Andrews completely wrong and out of her depth. As a film I actually quite like it, as much for the Cold War theme as anything, as I have a firm love for espionage shows set or made during that now extinct era. 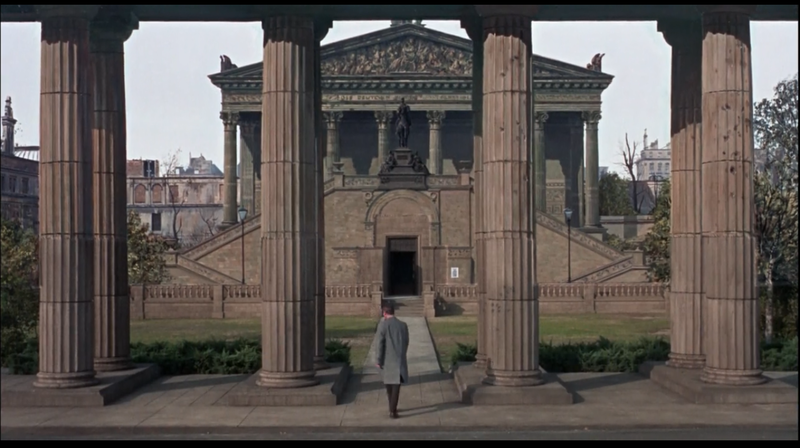 There was always something tangibly forboding and menacing about the Iron Curtain scenario that is sorely missing today in spy movies and so forth. 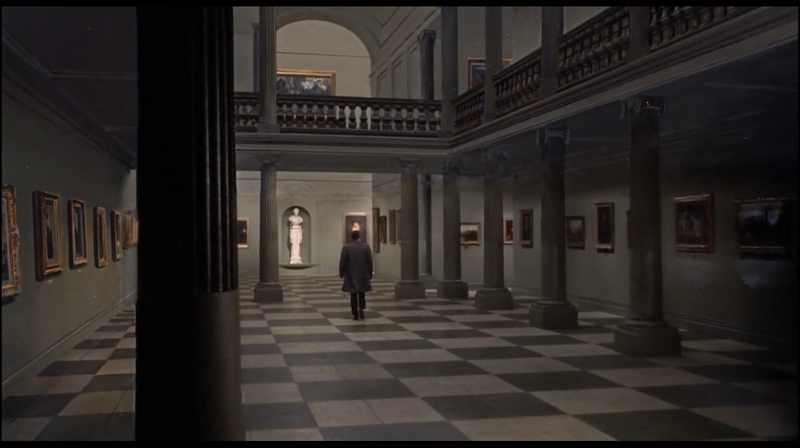 The recent TINKER TAILOR SOLDIER SPY was a breath of fresh air for me in that respect. Anyway, back to TORN CURTAIN - the story isn't half bad and some excellent set pieces may be found, notably the silent, savage murder in the farmhouse which still packs a punch today. 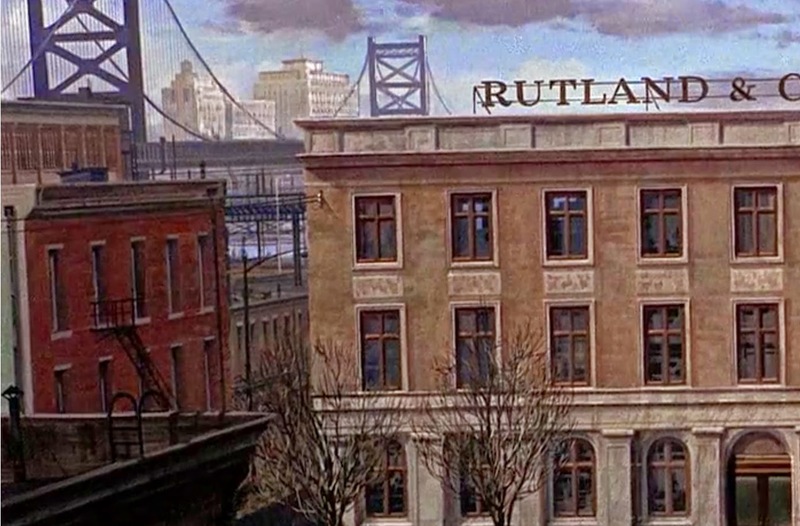 A number of terrific mattes are used in key sequences to great narrative effect. 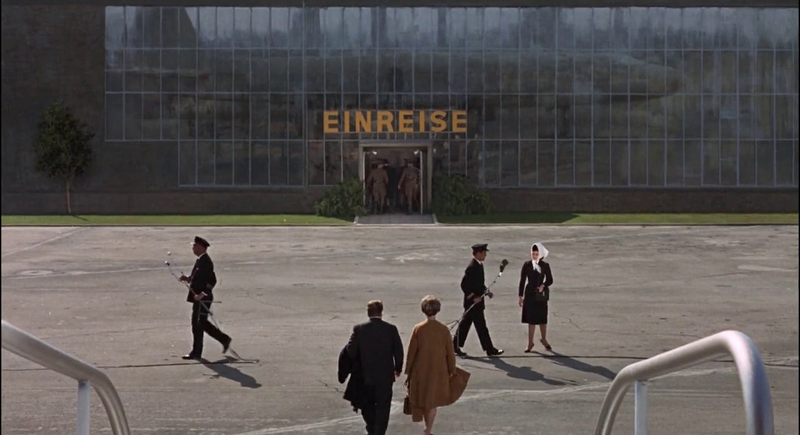 Early in TORN CURTAIN is this totally invisible Whitlock matte shot of the airport in East Berlin. Note the painted in reflection of the jet liner in the (painted) glass frontage. Brilliant shot which never calls attention to itself, and as with all of Al's work, was completed on the original negative for maximum quality. 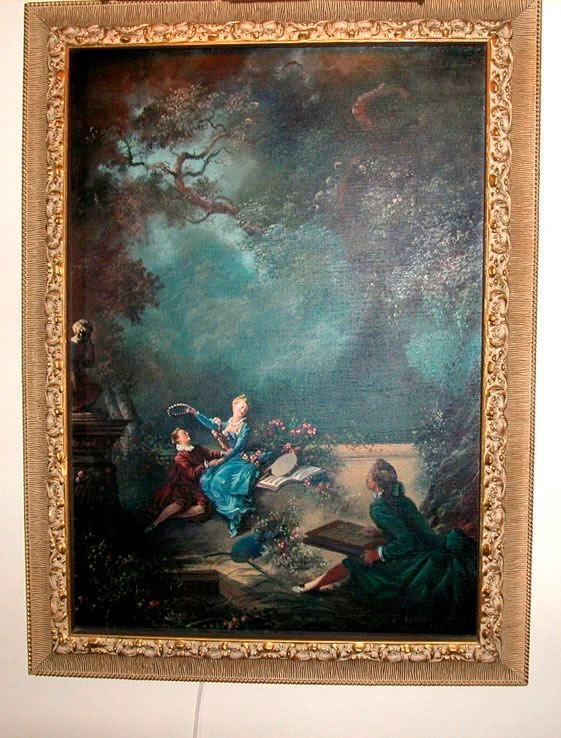 Now, here is that frame that I alluded to earlier... is it a matte or is it real? 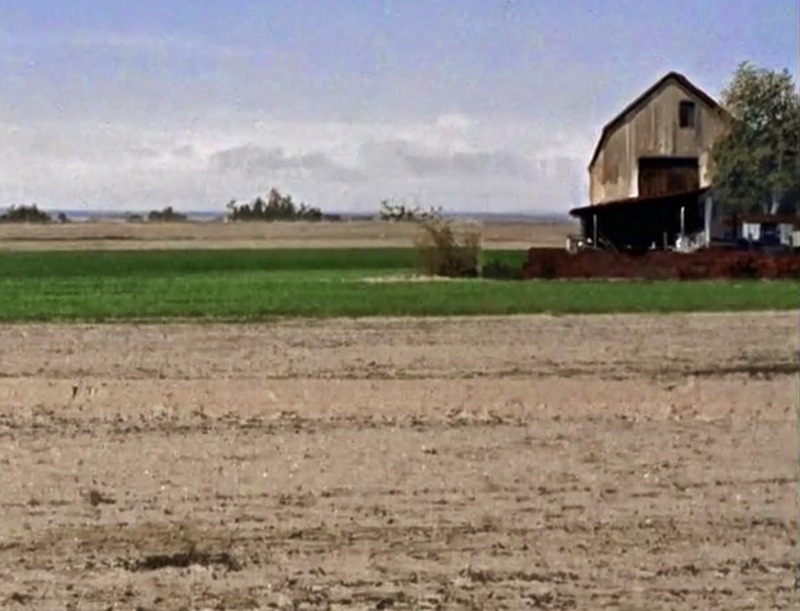 When viewing the film in 1080p resolution I was convinced the shot to be largely painted, with the mud in the foreground and the tree especially looking 'brushed in'. I approached Al's longtime friend and cameraman Bill Taylor with this frame and he didn't recall ever seeing it as a glass painting at Universal, nor on Al's reels and feels it's most probably a 'genuine' shot. I don't know, so let the reader look it over and judge. Although it's not very clear, I tried to get a blow up from the above mystery shot. Looks painted to moi. 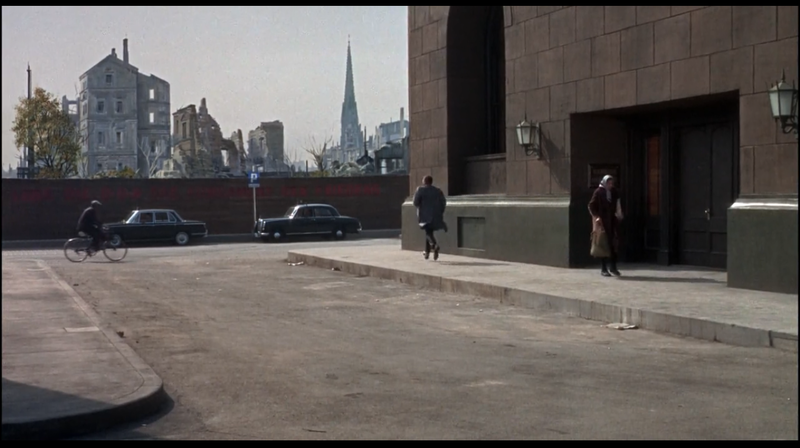 A pivotal sequence involves Paul Newman being followed by a nasty East German heavy through a museum, which as the film was made during the Cold War actual filming was not possible. 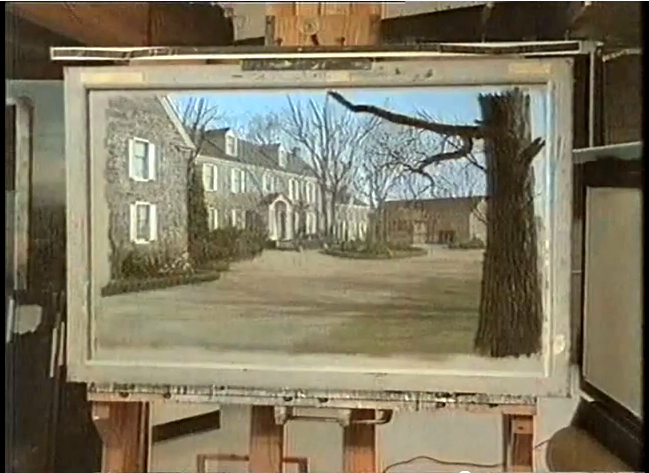 Hitchcock asked Whitlock if it would be feasible to construct the entire 5 minute sequence as an interconnected series of painted mattes, which in the end it was, and very successfully at that. 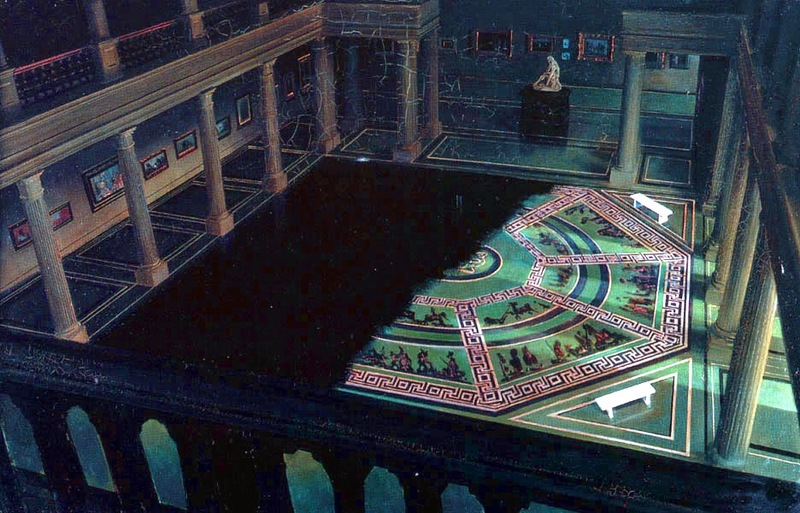 A partial set consisting just of some flooring was fleshed out considerably by Whitlock. Albert's matte art now showing signs of deterioration as the varnish has started to crack. 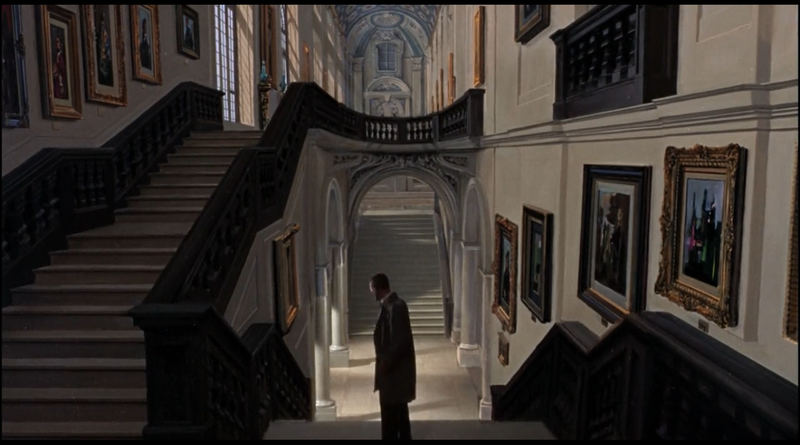 More museum mattes... almost all painted. Same... with even the 'artworks' on the walls being Whitlock's all inclusive matte work. ...and what a glorious shot indeed. Detail of Al's East Berlin painted museum. Until a few years ago I never suspected this shot to be a trick shot at all. A complete painting with no live action, very skilfully achieved. Incidentally, Hitch didn't at all care for the so-called 'method actors' and felt Newman was difficult. 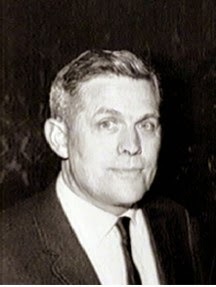 When asked by Newman as to what his motivation was to perform a scene as simple as going through a doorway, Hitch replied "Your pay cheque is your motivation". I wonder how Hitch got on with the great Montgomery Clift in I CONFESS?? Whitlock with the final matte from the museum chase. 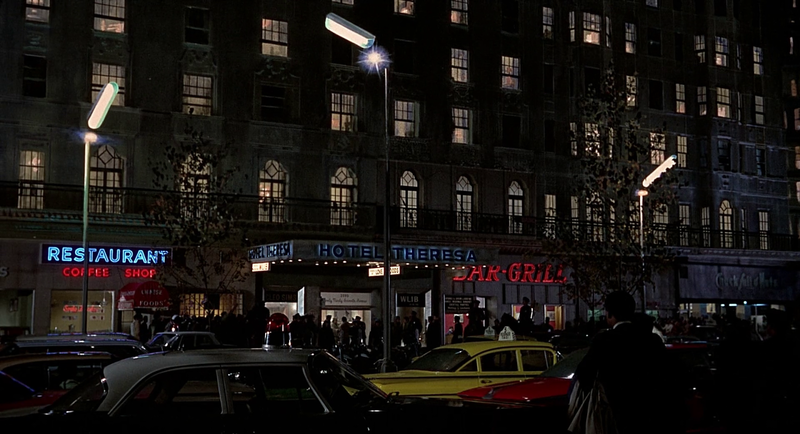 Newman exits via the back door into a matte painted East Berlin. Detail of painted post WWII Berlin rubble. 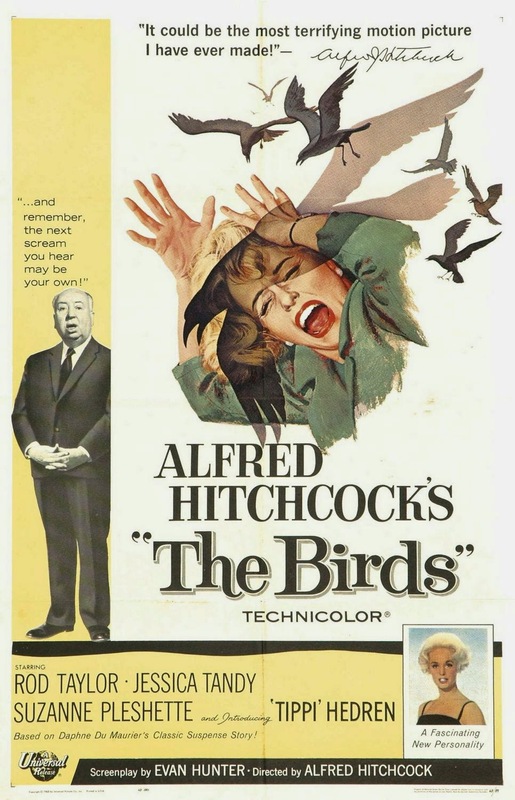 Now this is a really under rated Hitchcock picture that fizzled at the box office - no doubt due to lack of star pulling power and clear cut 'thrills'. 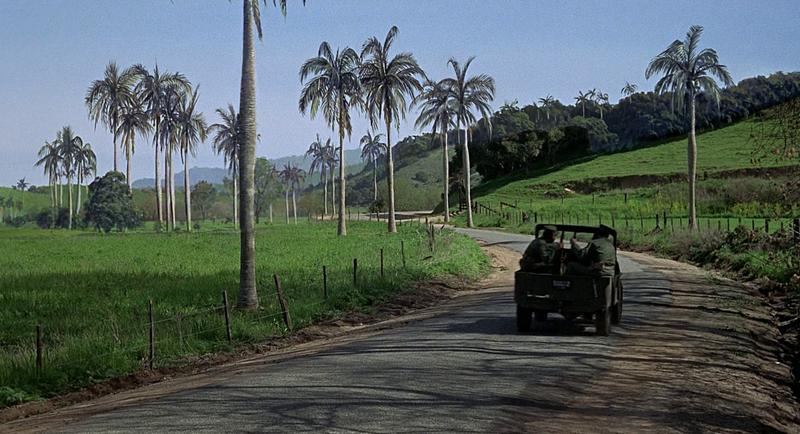 Nonetheless, it's a solid, beautifully made Cold War thriller set to a large extent in Castro's Cuba. While not 'stars' the cast are great, with the always excellent John Vernon particularly good and the under utilised Roscoe Lee Browne also strong. 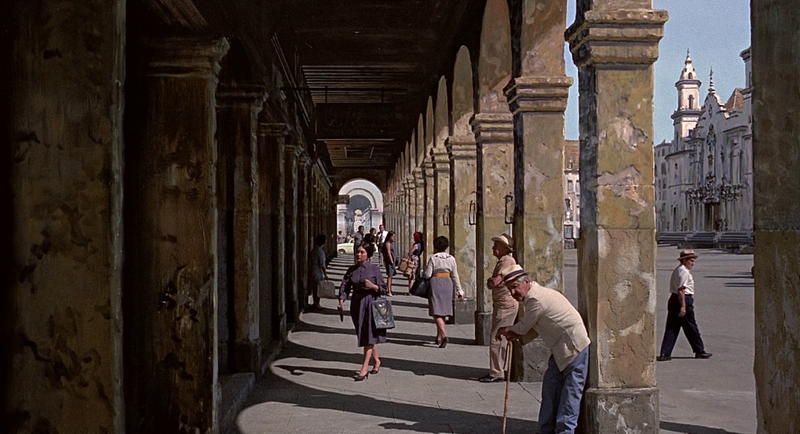 Good dialogue, beautifully photographed and supported with a score of truly outstanding matte painted shots by Albert Whitlock - the majority of which are undetectable and just fool us completely - such is their skilful application. 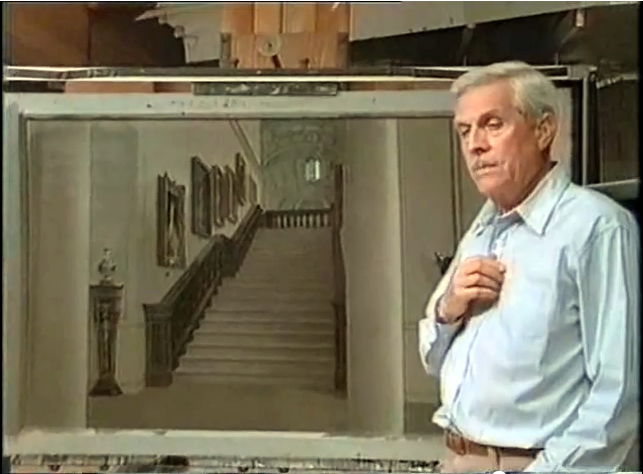 For the three previous Hitchcock shows, Whitlock was undercredited with the peculiar 'Pictorial Designs by Albert Whitlock' screen credit for some odd reason. 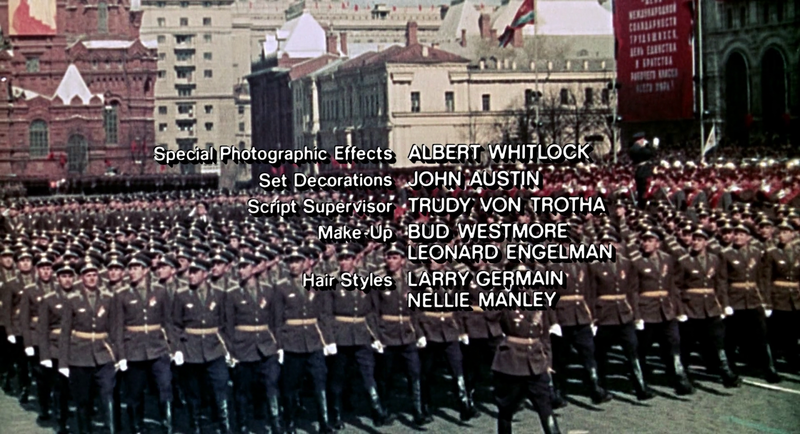 At last Al received a fitting credit here! In speaking with Bill Taylor recently he told me how much Albert liked this film and he recalled Al ringing him up one day and saying: "Hitch is back at the top of his form". 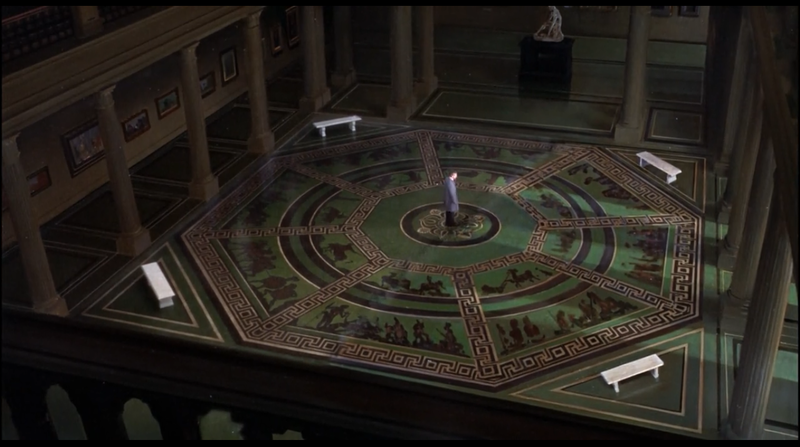 Partial minimal set to be extended considerably via matte art. The finished effect...and nobody ever noticed it. This is affirmative argument as to why Whitlock was credited as the 'master of the special effect that doesn't call attention to itself'. 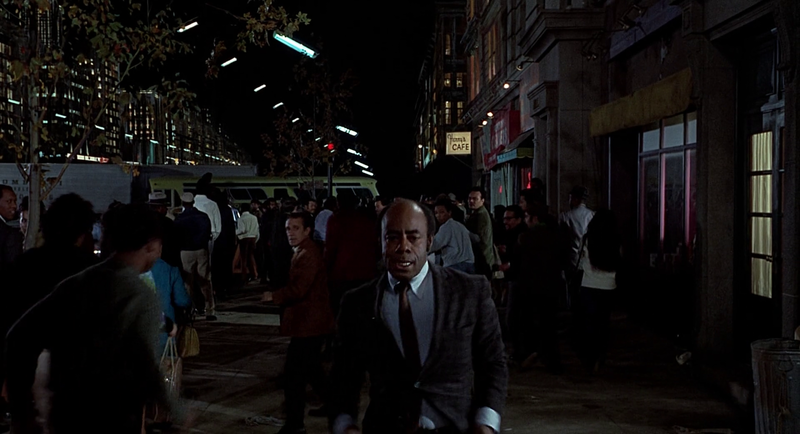 Roscoe Lee Browne runs for his life in this totally invisible matte shot where Albert has painted in all of the New York cityscape just above the roof of the bus, including the trees. Sublime, yet so loose and impressionistic if you blow it up, as was much of Al's best work. Here's a good close up look at some of the detail that Al has added in with a very 'free' and spontaneous brush. Now, I'm not sure here... it may well be real as I forgot to ask Bill about this frame and the block of buildings which extend down the street??? 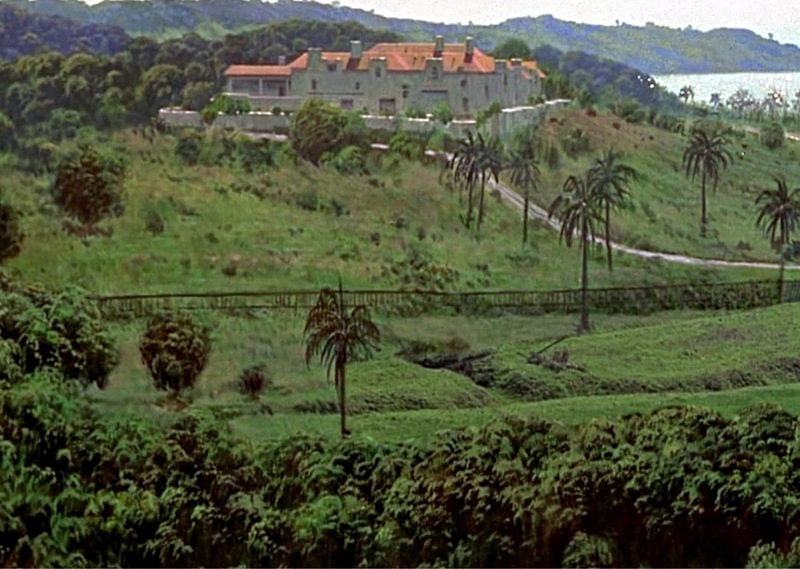 The Cuban hacienda matte is a full painting with only a tiny slice of roadway where the vehicle approaches between the painted palms. 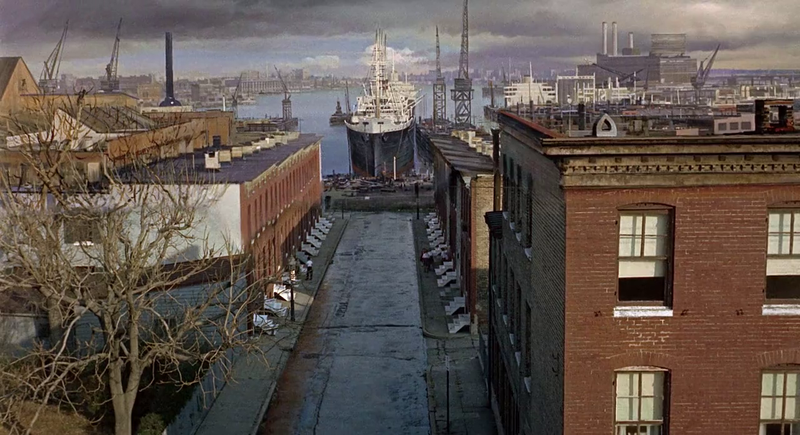 A beautiful matte, and one in which noted matte painter Jim Danforth told me he thought was one of Al's best. Note, even the ocean is trick work with animated 'sparkles'. 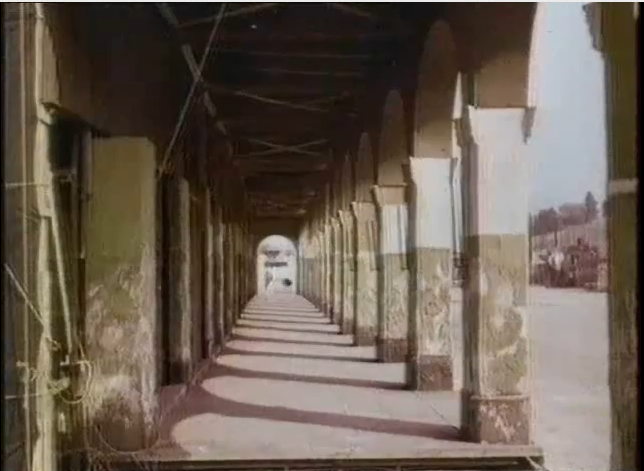 Matte photography by Universal's veteran effects cinematographer Roswell Hoffman, whose career went back as far as the early 1930's on big effects shows like THE INVISIBLE MAN with John P.Fulton. Some nicely delineated detail of above matte. Havana, Cuba as painted by Albert. 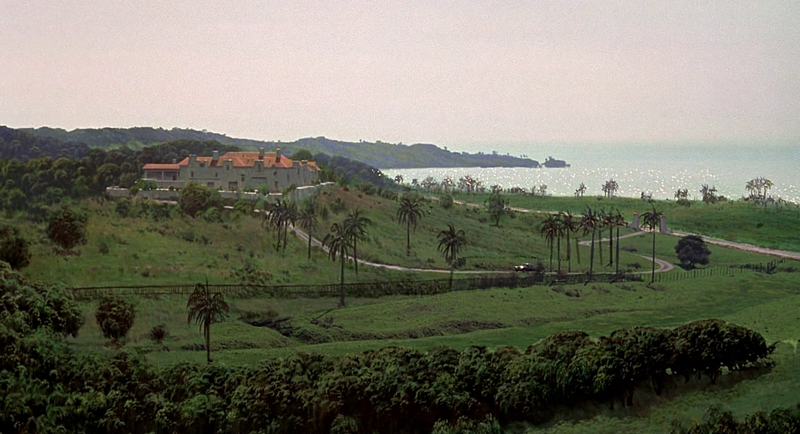 All except the immediate foreground (with some actual bushes moving in the breeze to sell the shot as real). Close inspection again shows Al's loose and impressionistic brush and paint handling. 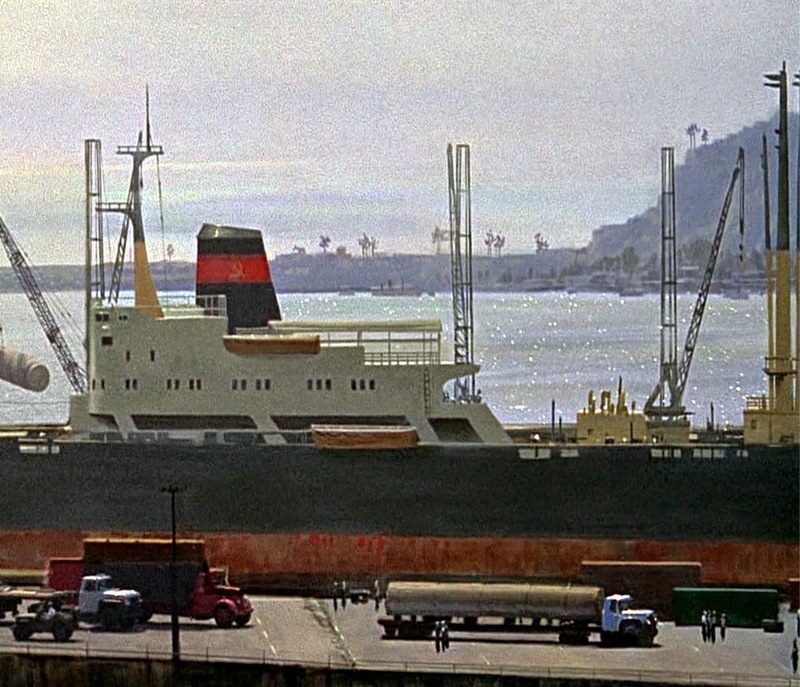 A basic location in San Diego forms the live action component of the Soviet tanker matte shot as seen below. The finished latent image composite that's fully convincing. Close detail of above matte. 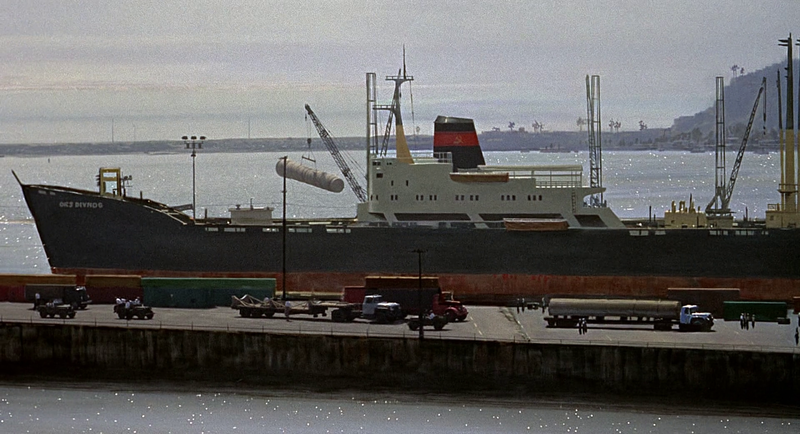 Note tanker truck and workers are all Whitlock art. 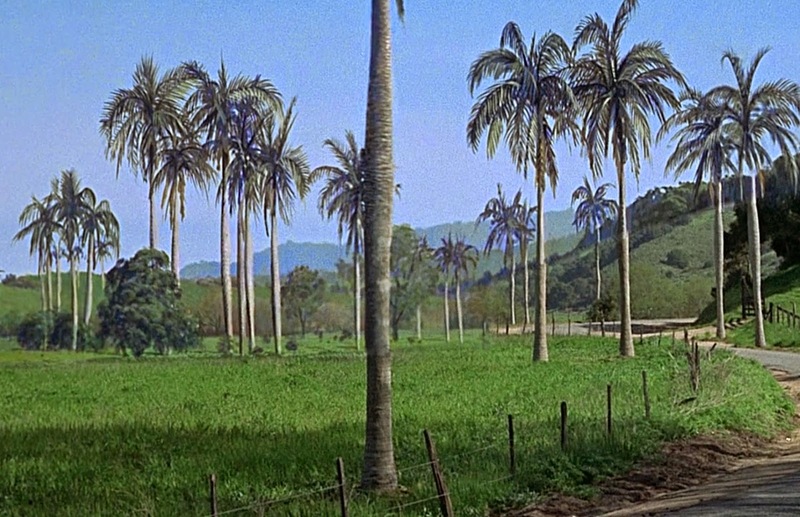 Cuban countryside simulated in California via matte art which adds in cocoanut trees and all of distant landscape. Whitlock's cocoanut grove and faux Cuban locale in close up. 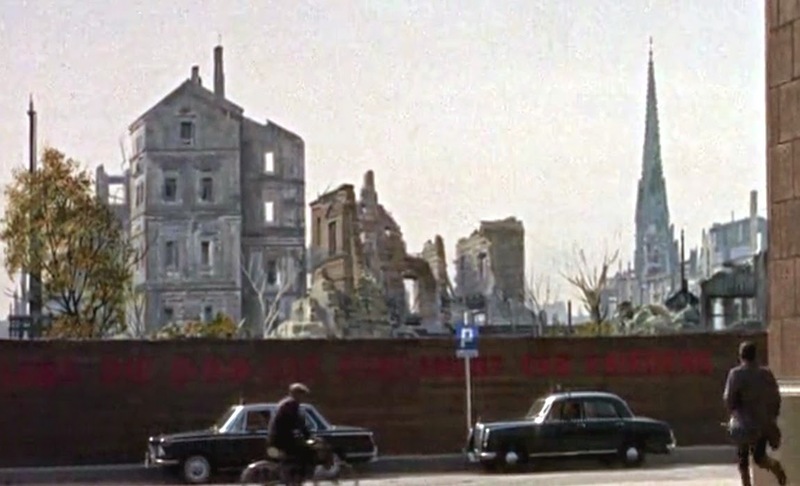 An interesting matte which for some strange reason does not appear in the BluRay, with this frame being taken from my DVD. 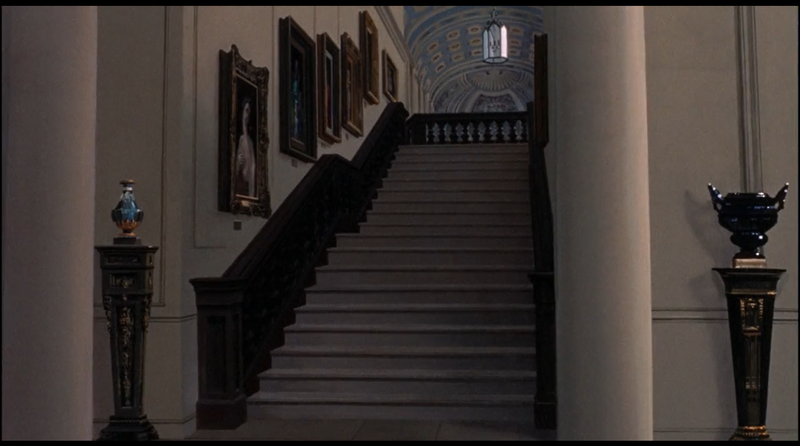 The wider sequence is in the BluRay but this one shot isn't. 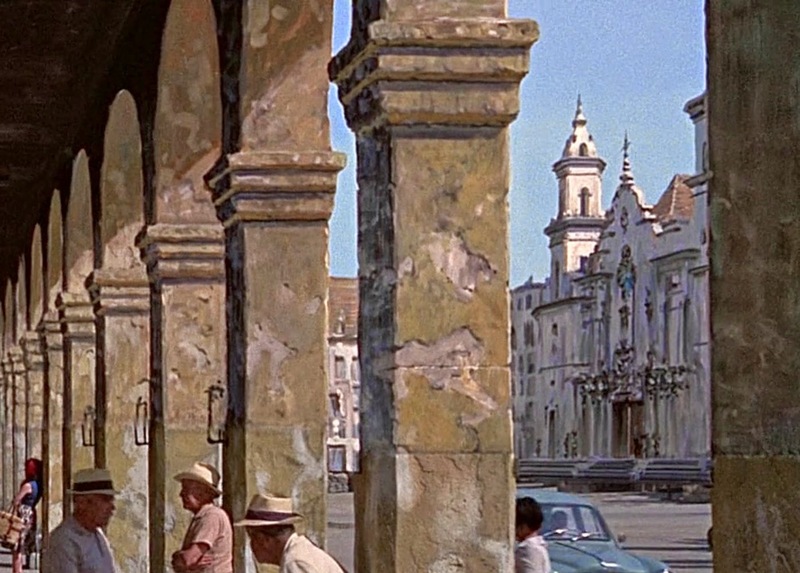 This very ordinary set, presumably at Universal, will be magically transformed into downtown Havana (below) with more alterations than you'd first think. ...Voila! Havana it is. 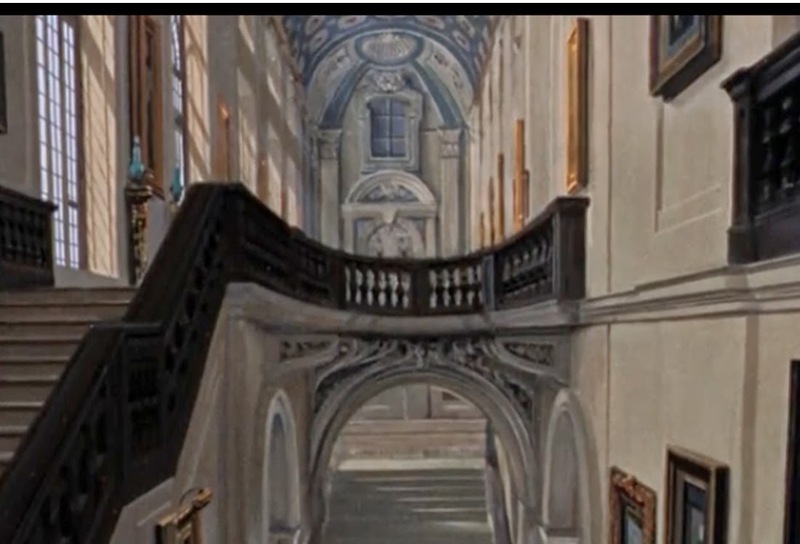 Note that in addition to the Cathedral, Whitlock has painted significant 'aging' to the archways and columns as well. Very nice close up detail from the above matte that beautifully demonstrates Albert's style and approach. 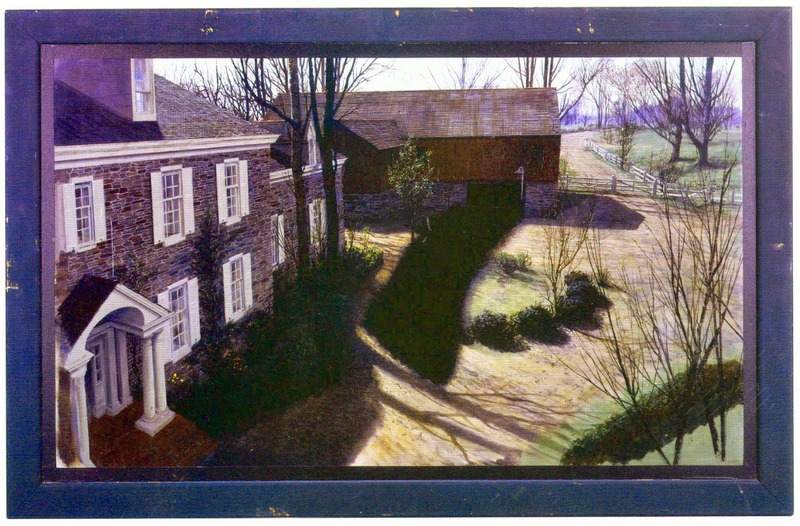 I've always admired the backlight and 'time of day' that Al accomplishes in his work.